I collect HO scale European wine wagons with over 300 in my collection. About 80 of them are Marklin. I will share information and photos with anyone who is interested. I have attached a few photos as a sample. 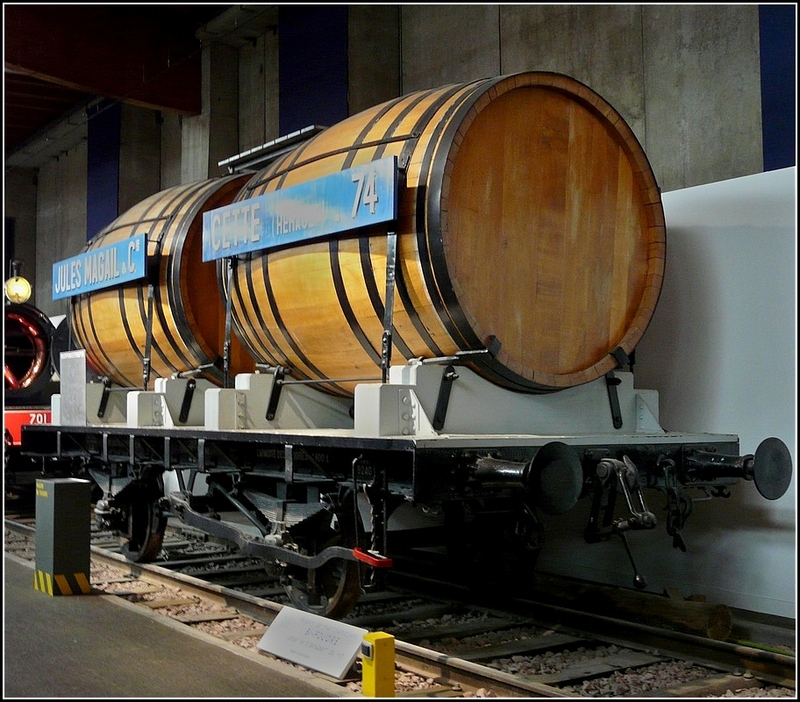 This topic welcomes our friends from the Italian Marklin forum who share our interest in wine wagons. 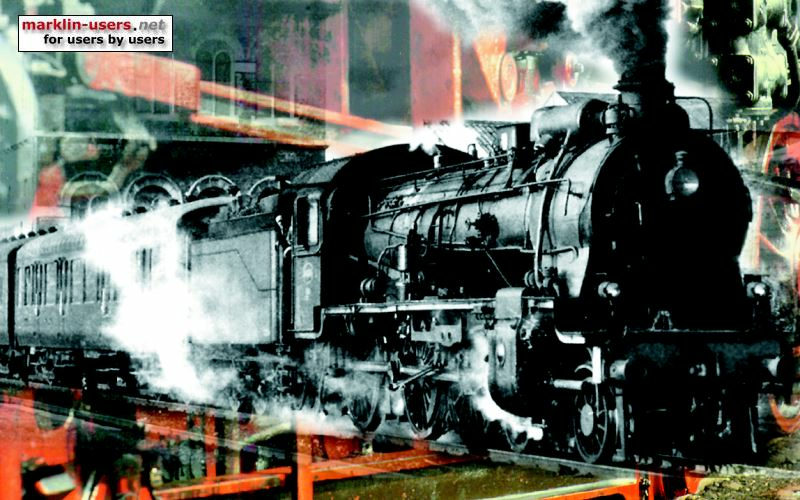 Click on http://www.marklinfan.co.../topic.asp?TOPIC_ID=1461 to see some great historical photos plus photos of models and layouts. I collect HO scale European wine wagons with over 300 in my collection. About 80 of them are Marklin. I will share information and photos with anyone who is interested. I have attached a few photos as an example. I find the wine wagons very interesting, thanks for sharing. However I would like to find for what purpose these wagons were used? I can only guess there were a number of possible uses. 1. Shipment of fully vintaged product to wine merchants for bottling and distribution. 2. Shipment of raw product to other vignerons for further matuaration. 3. Shipment of product (in whatever stage) to food manufacturing plants. (Example? the 48008 above is a condiments firm, who make food dressings). Wine cars are still used to transport wine to distilleries and to producers of sparkling wine. Hello winetrains, and welcome to the forum ^^ ! Very interesting wagons I never even knew Märklin made ... any dates and model numbers for the first two ? Any info on these ? The second one (Swiss) comes from 48809 (2006). Thankyou for interest. Check out the links below for photos of real wine wagons. I believe your VB wagon is a Vollon & Brown VB 36, French and released between 1948-1955. My collection contains 6 VB wagons (I love them) and I have attached their photos below. 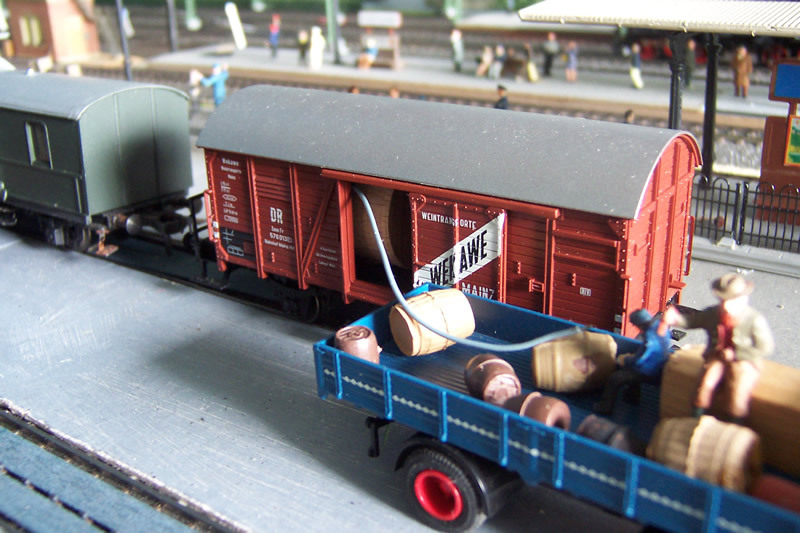 The first Marklin wine wagon (old single barrel) was part of a Marklin starter train set that included steam engine, wagons, track, transformer and controller. I had to buy the whole set on eBay just to get the wine wagon. It does not have a number. If you like old wine wagons, I have some very rare metal Electrotren wagons and have attached their photos below. They were made between 1957-1960. I was quite taken with your link to the Dujardin cars, because I too purchased an era III version from Liliput, and think it is a fine model. Davids Tillig 501167 bogie tanker is interesting too, the name SGTL is well known in France for transporting foodstuffs. I managed to bash up a free lance 4 wheel version of an SGTL tank, using a Fleishmann cast underframe, and a Thomas the Tank Engine tanker body. There is currently one of the VB bi-foudres on sale on e-Bay at 79 Euros. Welcome to the Forum Winetrains!! I really like the "Veuve" champagne car. Veuve is one of my favorite "less expensive" champagnes. Is that particular car a limited production run? Any idea what year(s) it was produced?? I have attached photos of more Marklin champagne wagons below. Thanks winetrains for the explanation on that first Märklin wagon (first example I've seen of a Märklin item with no number) ... I will now need to search for it ! 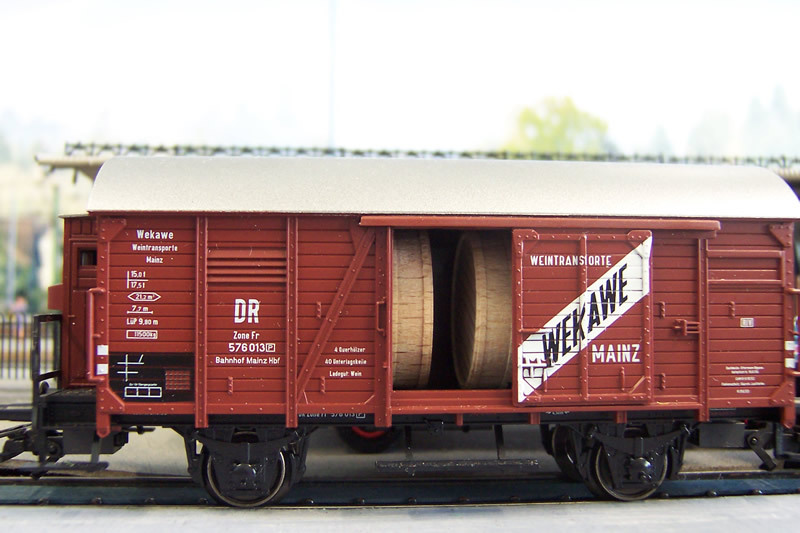 A couple more pictures of Marklin wine wagons you may not have seen. Marklin made them especially for KaDeWe, a large department store in Berlin. In relation to the box wagon, I was informed that only 400 of them were made between 1990-2000. I have HO scale wine wagons from ACME, Au Pullman, BLZ, Brawa, Electrotren, Fleischmann, Ibertren, JEP, JL, Josfel, Jouef, Liliput, Lima, L.S.Models, Makette, Marklin, Piko, Pocher, Prefo, Rivarossi, Roco, Sachsenmodelle, Schicht, Tillig, Trix and VB. Please let me know (or anyone else) if you want to see some pictures from any of these manufacturers. They are all on Flickr and Forum members can email me at TopFluc@gmail.com for instructions on how to view them. ECoS 50200, all FX and MFX decoders replaced with ESU V4s, operated in DCC-RailCom+ with ABC brake control. With the exception of the passenger wagens with Marklin current conducting couplers, all close couplers have been replaced with Roco 40397. I have posted below a photo of a Marklin wine wagon that has sliding doors and wooden barrels inside that contained bulk wine. It is a Swiss wagon made between 2000-2001. Thankyou for the photo Unholz, it is great to see the vintage wagons and how well the HO wagons are manufactured to model them. I have 20 different Swiss (SBB-CFF) HO scale wine wagons and particularly fancy the Brawa wagon whose photo I have posted below. Great collection, excellent VB references, very informative ... ! Below are photos of my Au Pullman HO scale wine wagon collection. I really like the character of these wagons. I only have one JEP wagon, its photo is below. It is HO scale and made of metal. You have been a member since 2011 and only show us this great stuff now! Thanks for sharing it and welcome to the discussion! I am very curious about wine cars in Italy. Do you have anything in your collection from Italy, or know of databases with images of Italian prototypes? I am also interested in Kimball's questions wrt to wine transport uses and production. I would really like to see if anyone has modeled dioramas/layouts with train cars being loaded on a winery siding. Hoping to model some Italian vineyards with a winery and perhaps have a winery doing just that. Yes, I have been enjoying this thread immensely. This hobby can be compressed readily into quite specific themes. It is a matter of thinking beyond the square as they say. I will take photos of the SGTL tanker in the next few days. One gets a bit bored with beer and banana carriages, good subject. There were many reasons why I didn't share earlier, some selfish. One gets wiser as one gets older. I find wine wagons fascinating, I know they are popular, and was surprised I couldn't find a user group to discuss and enjoy them. Now we have that group. I have posted below photos of my Italian wine wagons. Enjoy. The Pocher wagons are special, the first one made between 1954-1956, the next two have slightly different coloring and were made in the 1960s. Difficult to find. The ACME wagons were manufactured in 2011 (I received them last week). Thankyou for your support and encouragment. I have 7 SGTL HO scale wine wagons made by Electrotren (2), REE (4) and Tillig (1). Please let me know if you would like me to post photos of any of them. great collection, we too have a topic about wine wagons with some interesting old pics. I've linked this topic to ours. Great comm between forums Alberto ! They are all beautiful illustrations, both prototype and models. I will be doing a little modification to build a few wine wagons based on those pictures. David, I hope you don't mind my adding a couple of my own pictures. 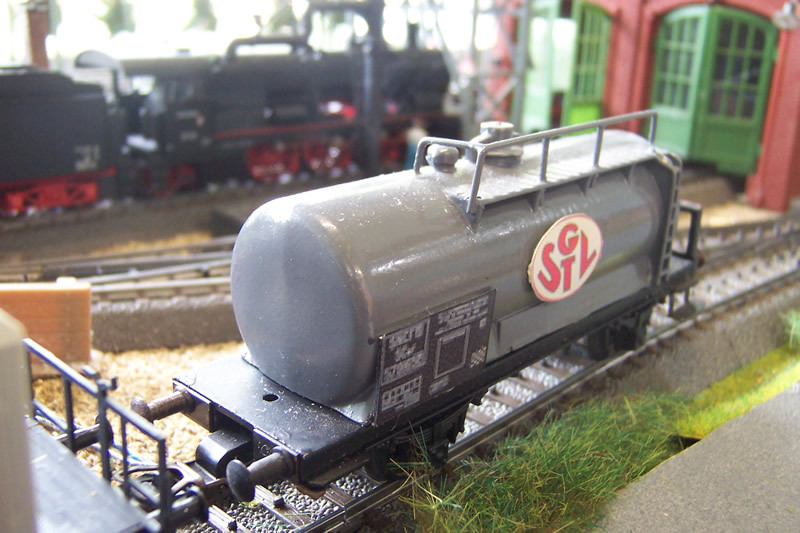 On my Altkloster layout, I have 3 wine wagons, of different type. The first is from Marklin freight set 48801 (2002/3). I staged the picture using the Bellingrodt picture from Wuppertal in 1956 (thanks Alberto for that terrific link). Here the wine is being loaded into smaller barrels for distribution to wine merchants around the town of Altkloster. Thankyou Alberto, I especially love your historical photos and have edited the beginning of this thread to reference your Italian forum. To celebrate, I have posted below a photo of one of my favourite wine wagons, a rare Josfel wagon comprising 3 brown barrels on a flat tray with two white longitudinal ties. Not a Marklin wagon, but one to be admired. Thankyou Kimball, we can never have too many photos. I have a Piko version of your wagon (pictured below) but I like your Marklin version better. On a sad note, I have included a photo of my Honda Euro Accord that was crushed by a blue Commodore two weeks ago in a quiet Melbourne residential street. I pick up my new car tomorrow. Very sorry to see your car like that, I can only be glad that no one was hurt. I have not had anything like that since 1964, when my first Holden FJ was hit sideways and pushed off the road by an old Customline. The pie, milk and Coke lying on the front seat looked like coffee and stew on the dashboard. Here is another photo of the Wekawe van, and also one of the SGTL tanker which I bashed from a 1960s Fleischmann cast under-frame, and a Thomas the Tank Engine body. Suitably redecorated. I believe that the prototype of this model also had barrels. However, they didn't travel openly but "undercover". After seeing what is a small part of your collection, I too am tempted to get at least a couple of wood barrel tankers. The Electrotren tank looks very interesting, but I also like the Au Pullman ones (nice variety). As well I like the Acme van versions, a pity they can't include the inside barrels. I would like to see all your collection, so will send an email so I can see the Flickr set. Suddenly, I've gotten very thirsty. The size of these tankers! For some strange reason I was expecting to see just a whole slew of the collector's variations on the "Bordeaux" model #308. Collector of Märklin fine-quality trains since 1966. I am about to make you even more thirsty. Later today I will create a new HO topic "Modelling in a wine cellar" which will have photos of my layout running behind and through racks of delicious Australian wines. When viewing, I highly recommend a glass of Shiraz in hand. Yum, I look forward to starting a debate here, but I will argue that Electrotren has made the best HO scale wooden barrel wine wagons. John, more Marklin wine wagon photos below to stop you getting bored.